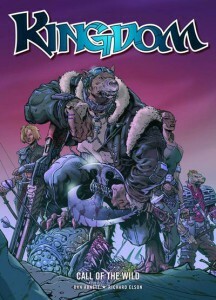 Rebellion/2000AD, the folks who brought you Judge Dredd, now bring you Kingdom: Call of the Wild, a new full-color trade paperback written by Dan Abnett and illustrated by Richard Elson. “Earth, the far-future. With the planet now overrun by gigantic alien insects, mankind is all but extinct. Genetically engineered dog soldier, Gene the Hackman, now protects one of the last remaining human beings, a young girl named Leezee Sower, and the two of them have traveled to the land of Auxtralia, straight into the territory of a new pack!” Look for it this March, or find out more at The Book Depository.